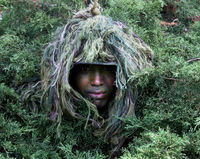 Ghillie Suit – Pennsylvania: Hunt. Fish. Shoot. So I read a “How To” list every morning. Well, I don’t actually read it every morning. I get an email about it. Sometimes I take the time to read it. This one caught my attention, and I know you will appreciate it! After you make one, please send me photos and some feedback, and I will post your response for others to see. Even though I do not know one Ghillie who would own a suit like that it still ROCKS !! !